This was my quick and easy lunch today, so I thought I’d share the delicious, happy love! To start, I had leftover rotisserie chicken, and 1 Ezekiel tortilla. I scratched my head for a bit and remembered it was Friday. Friday means pizza, at least it does in my book! Then I saw the BBQ sauce and that’s what sealed the deal! 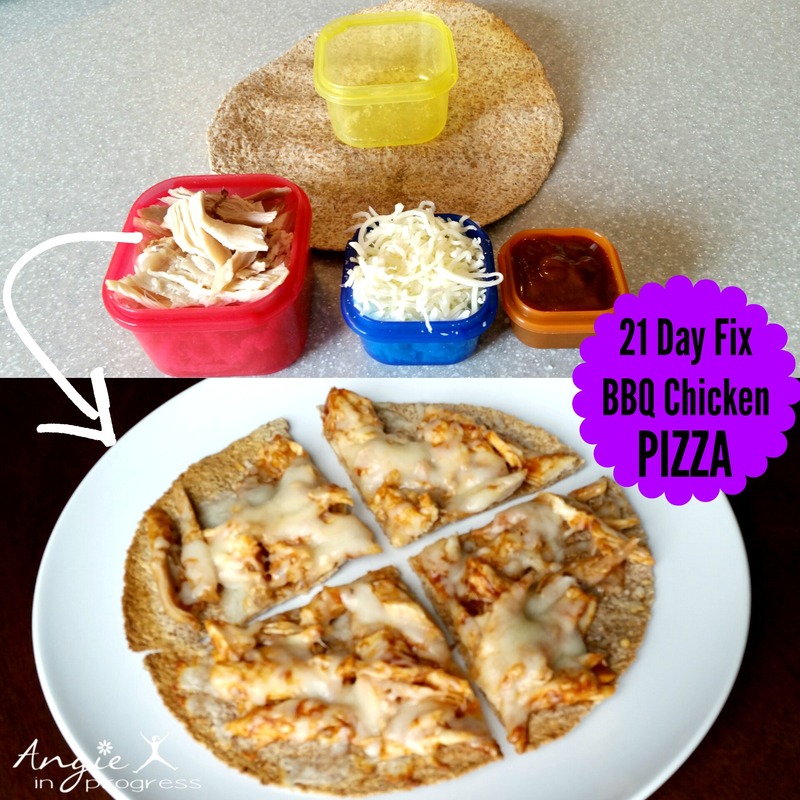 I whipped out my 21 Day Fix containers and 5 minutes later I was eating this delicious treat! PS – 21 Day Fix & 21 Day Fix Extreme NOW AVAILABLE with the all new all new Annual ALL ACCESS Beachbody on Demand Membership (like workout Netflix)! Get 12 months ALL Access to every Beachbody Program ever made, including all new releases, for 12 months! *If you decide to try one, be sure to sign up for my next VIP support group! Anyway…on to the recipe! This was SO delicious…I think it’ll become part of my rotation! *optional – a purple (or half a purple) container of fresh pineapple would be amazing! I spray my tortilla with a little olive oil and pop into the toaster oven for 2-3 minutes. Meanwhile, mix the chicken and bbq sauce together. Place on top of pre-warmed/toasted tortilla. Top with shredded cheese. Bake in oven (or toaster oven) for about 5 more minutes until the cheese is all melty and scrumptious-looking! Pour 1/2 c water into a small saucepan. Add all of ingredients except the olive oil and whisk together. Bring the sauce to a boil and continue boiling for 3 to 4 minutes. Remove from heat and slowly stir in the olive oil. * This recipe will equal about 2 orange containers. Use half for the pizza and save some for later! If you have the 21 Day Fix program, but lack the support to help you plan your meals, stay on track with your workouts, stay motivated and reach your goals…I can be your FREE coach! And I would be happy to help you! Previous PostPrevious Get the 21 Day Fix OR Fix Extreme FREE! Next PostNext Delicious Strawberry Vinaigrette!